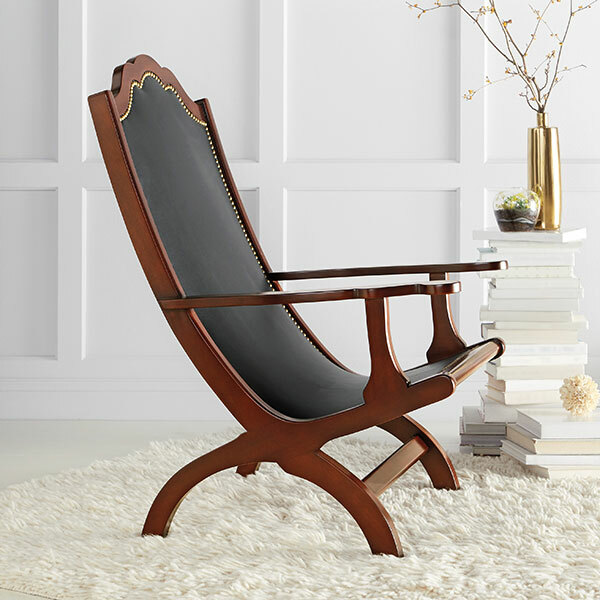 Thomas Jefferson favored the Campeachy chair form for its classical associations and the comfortable posture it offered, referring to it as “. 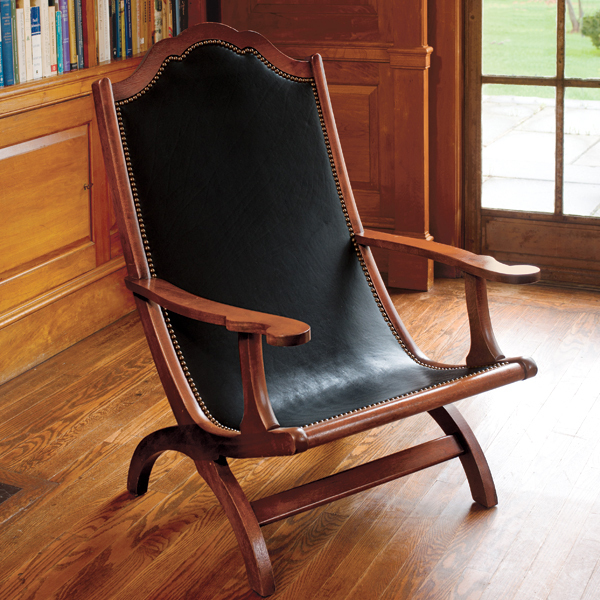 . . that easy kind of chair.” Jefferson appears to have popularized the chair when he served as President, and he continued to use it during his retirement at Monticello. 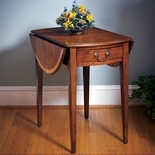 The first versions were imports from New Orleans, where the form evolved in the early 19th century, and enslaved carpenter John Hemmings made examples at Monticello. 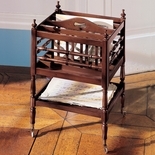 This reproduction is based on an example now on view in Monticello's Parlor. Made of mahogany, the chair features the typical X-shaped base, generous armrests and a serpentine crest rail. The low-slung seat of reinforced leather still affords the noteworthy comfort that Jefferson found so desirable. 39"h x 27"w x 24"d. Shipping included in price. Please allow 2 weeks for delivery. Freight Truck Delivery in the 48 continental states only. Express shipping not available. Thomas Jefferson returned to his own “dear Monticello” after he completed his second term as President in 1809. With considerably diminished financial resources, he turned to the skilled slave joiners who had helped build the plantation to construct many of the furnishings for Monticello. Campeachy chairs were favorites for Jefferson, and it took him many letters and more than ten years to get a Campeachy chair sent from New Orleans. 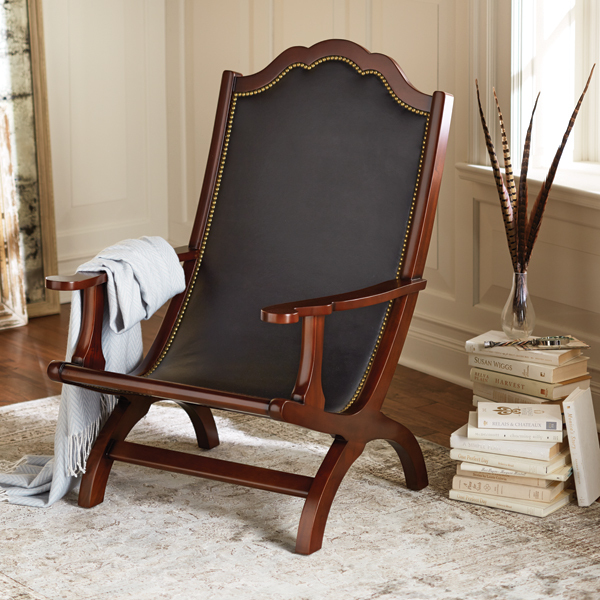 In Jefferson’s time it was known as a “lolling chair” or “hammock chair”; Jefferson called it a “Campeachy hammock.” The mahogany for the original chairs came from the Mexican province of Campeche, hence the curious name. This item will ship via motor freight carrier. Your phone number is required when placing your order. Carriers schedule deliveries M-F, 9am – 5pm and will call first to make arrangements. Carrier will require that you sign for the shipment, please carefully inspect your order and note any damages on the delivery receipt. You may refuse delivery if you discover damage.